– Martin Sheen, a scarecrow of a man. Badlands starts on a very subdued note. A sleepy Midwestern neighbourhood, Martin Sheen as a garbage collector, hassling his co-workers into buying some boots and kicking a can down the street. A plinky-plonky score soundtracks all of this, lending a tone of innocence to the setting. We appear to be lined up for one of those ‘delightful stories about nothing’ that certain directors go in for, and I fully expected this from Malick. The great thing about Badlands is that this innocence coats everything. With sparse dialogue, most of the film is narrated by the fifteen year old Holly (Sissy Spacek) who admittedly doesn’t know much about the world and is just looking for a swell time. A relationship flourishes between the two protagonists, with all of the hallmarks of an offbeat romantic comedy. Then Kit (Sheen) kills Sissy’s father, seemingly on a whim. Oh. As the couple skip town, faking their own suicide, they head north in an attempt to recapture their innocence and carve an identity out for themselves as lovers. Still this naïve tone persists. 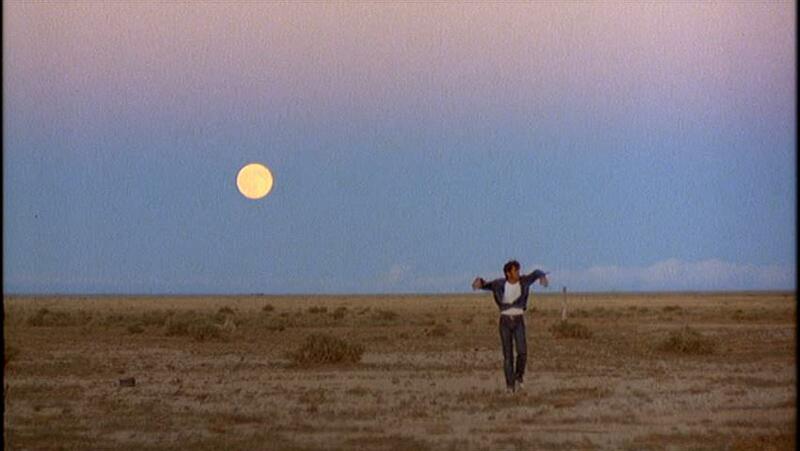 And this is the brilliance of Malick’s first movie. The couple encounter more and more problems as various witnesses spot them, resulting in an almost ridiculous body count. Kit kills without blinking, telling Holly that she shouldn’t think on it too much, because that’s bad luck. With each murder, we feel rather bemused as an audience, not knowing what to make of these random acts. But this is precisely the effect of Malick’s innocent girl narrator, beautiful scenery and childish score. Everything is filtered through the lens of a bemused fifteen year old who is being swept through a series of events she cannot really begin to process and understand properly. So the murders are glossed over, not given their due weight, and to us this feels almost farcical at times. As the film progresses however, Holly becomes more and more disillusioned and the youthful standoffishness turns into numb detachment. It still doesn’t feel like we’ve watched something as brutal as Natural Born Killers (which it has been suggested is based on the same source material) but if we attempt to recount the couple’s actions objectively, it seems like a much darker tone would fit the subject matter. This is why Badlands works so well, it’s a killing-spree film with no emphasis on the killing. Instead, we see it all as youthful antics between a couple in love, becoming complicit as an audience in the same fuzzy logic that allows Kit and Holly to barrel through life as if it’s a dream shorn of consequences. It takes a little time to digest, and separate the tone from the events, but in the end we are left with a brilliant coming-of-age movie. Holly does grow up, deciding she wants out but (boys will be boys) Kit carries on a cowboy to the last. Malick has much to say about the American male and his need to belong (watch out for the imagery of hats throughout) and this is what is most tragic about the movie. As the narrator and film’s perspective both mature towards the end, Kit cannot or will not. Badlands is insanely impressive for a directorial debut, and has aged well, given it’s now forty years old. This is a very different fare from the Tree of Life, although certain cinematographic buds can be seen, and I thoroughly recommend it. Even to those who are absolutely convinced they hate Malick…as I was!